The method of hot-wet gas analysis is widely used – in power plants, in waste incinerations, in paper, glass and cement industries and many more. A partial flow of gaseous components is withdrawn by a sampling probe and sampling pipe and led to the analyser cabinet. The sample gas is tempered at 185 °C for the whole gas path and monitored for flow and temperature. This high temperature level is necessary in order to prevent condensing of water-soluble components. The multi-component analyser is the heart of the hot-wet measuring system analysing simultaneously up to 12 components. That includes e.g. HCL, NH3, H2O, CO, NO, NO2, CH4, SO2 and CO2. Oxygen is measured by an integrated zirconium dioxide sensor. Our gas analysers are qualified for almost all applications. 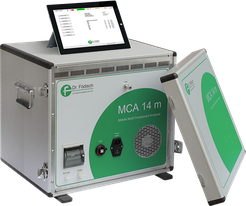 The types MCA 04 and MCA 10 passed the suitability test and got certification according to EN 15267-3 (QAL1). Mobile measuring equipment offers high flexibility for special situations. Test it!